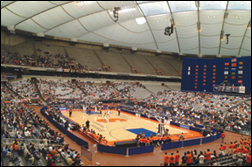 SYRACUSE, N.Y. – The men's basketball team tied a school record with 16 blocked shots in a 75-61 victory against the University of Illinois-Chicago in front of 16,067 at the Carrier Dome. It was the sixth-straight victory for the Orange, who improved its season record to 9-2. The Flames had a modest three-game winning streak halted. UIC's season record is now 6-5. Syracuse watched a 10-point lead dwindle down to two points right before halftime. UIC went on a 10-2 run during the final four minutes of the first half to turn a 32-22 deficit into a 32-30 halftime score. SU blocked 11 Flame shots in the first half. The Orange came out of the lockerroom to tally the first seven points of the second half. Junior forward Terrence Roberts was responsible for five of them, while freshman Eric Devendorf had a steal and a layup to give the Orange a 39-30 lead - at which point UIC coach Jimmy Collins called a timeout just 1:41 into the second period. Josh Mayo and Justin Bowen hit jump shots to cut the Syracuse lead to 41-37 by the 15:41 mark. After that, the Orange put together a 21-8 run which gave it a 17-point advantage (62-45), its largest of the night, with 8:16 remaining. Six different players scored during the spurt. Devendorf, senior guard Gerry McNamara and freshman shooting guard Andy Rautins scored three pointers, while Roberts tallied five points off a three-point play and a tip-in. UIC guard Othyus Jeffers, who finished with a game-high eight offensive rebounds, hit two free throws with 3:55 remaining to pull the Flames within 10 points (69-59), the closest they would come. Bowen finished with a game-high 21 points and 11 rebounds, while Jeffers chipped in with 16 points and 10 boards. For Syracuse, Roberts led four double-digit scorers with 19 points. He also collected 10 rebounds and four blocks. McNamara finished with 18 points and tied his career-high with 12 assists. He moved into 12th place on the school’s all-time scoring list, ahead of Rony Seikaly and now has 1,732 points for his career. With two steals against the Flames, McNamara moved into a tie for seventh place on the SU career steals ledger with Lawrence Moten (215 steals). The Orange got 12 points out of Devendorf and 10 points from Demetris Nichols. Defensively, junior center Darryl Watkins contributed with a game-high seven blocked shots. The last time Syracuse recorded 16 blocked shots in a game was November 28, 2001 against Colgate. Syracuse was without sophomore guard Josh Wright, who missed the game with a left foot injury. Up next for SU is a trip to Gerry McNamara’s neck of the woods to play Towson on Dec. 27, at the Wachovia Arena in Wilkes Barre, Pa. The game is scheduled to begin at 7 p.m. and will be televised by ESPN Regional. SIRIUS Satellite Radio will carry the broadcast on channel 122. Other home games during the holiday week include Kent State on Dec. 30, and Texas El Paso on January 4, 2006.